When your software operates in an unreliable networking environment, it can be very challenging to automatically maintain your software installation. These environments are quite common. Police cruisers and ambulances use laptops to run software in the field, relying on cellular technology to distribute updates. Traveling salesmen use proprietary laptop business software and are constantly going in and out of network coverage. Medical staff use their mobile pc’s in large medical facilities, where dropping connections in elevators and dead Wi-Fi spots is common place. In scenarios like these, professionals are using software that must be maintained. In today’s professional environments, software maintenance is expected to “just happen”, without interrupting the work of the professionals using the software. Software publishers who create software that operate in environments like these all face the same challenge of maintaining their software without requiring support staff to take possession of the hardware. The AppLife Update Solution provides the answer for many software publishers whose applications operate in environments like this. With the AppLife Update solution, software publishers create and publish self-contained update packages that migrate an installation from one version to another. These update packages are retrieved by the client software when network connectivity is present. Once the update package is retrieved, network connectivity is no longer required and the update can be applied, performing the work necessary to maintain the deployed installation. As the update package is downloaded, the partial download is cached locally so that any interruption in network connectivity will not require restarting from the beginning. The flexibility of the AppLife Update solution provides the ability to change the behavior based on known circumstances. When it is known that the software being maintained is going to operate in an unreliable networking environment, it is possible to handle network connectivity errors differently than normal. Normally a network connectivity error would be unexpected and the user would be notified of the situation. Instead, the application can postpone the update retrieval operation for a short period of time and try again. And try again. And try again, until the update retrieval succeeds and can be applied. When the application launches, a background update check is performed. If an update(s) is available, the update packages are retrieved in the background and without user interaction. If network connectivity is lost, the retrieval is postponed and continually retried in the background without user interaction until the update is successfully retrieved. Once retrieved the user is prompted to either apply the update now, or when the application is closed. If the user elects to apply the update, the update is applied and the application restarted. If the update is deferred until the application exits, the update is applied as the application exits and the application is not restarted. 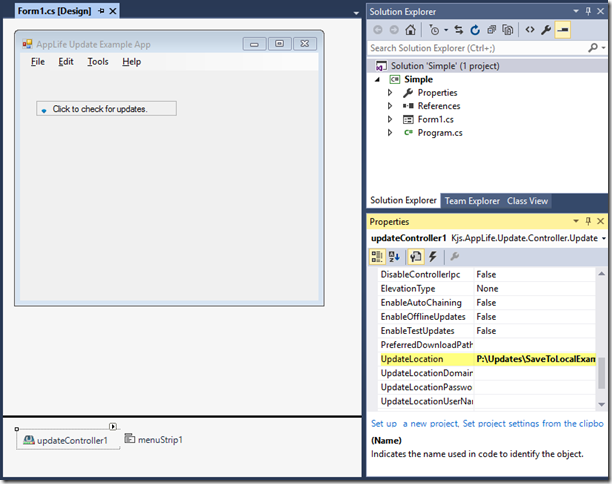 The example project contains an Updater class that controls the update check and retrieval process. Inspecting the Updater class, you’ll see that the class maintains an AppLife Update Controller and uses the API methods and events of the update controller to pause and retry as network errors occur. When an update package is successfully downloaded, an event is raised, alerting the primary application that an update is ready to be applied. The implementation code in the primary application is very simple. 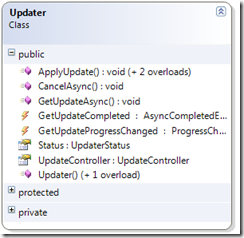 An Updater class is instantiated and the Update Controller properties are configured. Once configured, the GetUpdateCompleted and GetUpdateProgressChanged events are hooked before calling the GetUpdateAsync method. That’s it. Any updates will be retrieved as the network allows. When the completed event fires, the Updater status is checked and the user is prompted to apply the update now or when the application exits. The Updater class wraps an AppLife Update Controller and exposes a single method that implementing code will call to perform the entire update process. We want to take a look at the GetUpdateAsyncmethod. This method calls the Update Controller’s CheckForUpdateAsync method and then returns. The update process continues in the CheckForUpdateAsyncCompleted event handler. If an update is present, the DownloadUpdateAsync method is called. When the download completes, the GetUpdateCompleted event is raised. When these asynchronous methods are called, any network errors will cause the completed event to fire, and the event argument’s Error property will indicate the cause of the error. Based on the error information, we can take appropriate action. In this example, we are considering any WebException or IOException to indicate a network error. Your implementation can improve on this, based on environment specifics. At any rate, when a network error is detected, the updater class goes into a wait mode and try’s the check/download again after a period of time. Eventually, the update download is completed, and the GetUpdateCompleted event is raised, triggering the client application to prompt the user. Of course, the user experience behavior is completely customizable with just basic coding. The AppLife Update Controller performs the heart of the technical challenges involved in this implementation, and the Update Engine is what lets you package up any work that is necessary to maintain and migrate your deployed installations. So I invite you to take a look at the example and evaluate it for suitability in your own environment. Feel free to contact our technical support team with any questions. The beauty of .Net configuration files (.config) is that they let you easily change the behavior of your application for individual installations. This allows for a great deal of flexibility, especially with service related settings. With this flexibility though, also comes a maintenance challenge. Unlike all of your other application files, configuration files usually can’t be simply replaced during a maintenance update. Doing so would lose any customizations made to support the specific application installation. As your application evolves, it is inevitable that your configuration files will require modification. With AppLife Update, you can easily maintain .Net configuration files without replacing them by modifying the existing files. I’ll cover three different methods that you can use, based on the type and scope of the config file modification that is necessary. Using Xml Update Actions is great for adding elements and updating attributes. As an example, let’s say that we use appSettings in our application and we need to add a new appSettings value in support of a new feature. 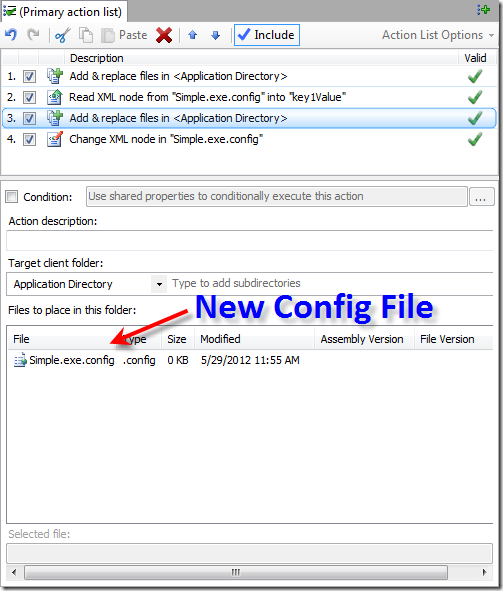 We can use an Add Xml Element update action to insert a new appSettings value into the existing config file. To migrate version 1 installations to version 2, in addition to replacing the application assemblies we must add a new entry to the appSettings collection. To do this, we’ll use an Add Element update action. When configuring Xml update actions, XPath expressions are used to reference the specific Xml elements that you are interested in reading and writing. To accomplish our goal, we will use an XPath expression to access the appSettings node, and then add a new element to that node. The config file is located in the Application Directory and is named Simple.exe.config. The name of the element is add, and the new element has two attributes, key and value. 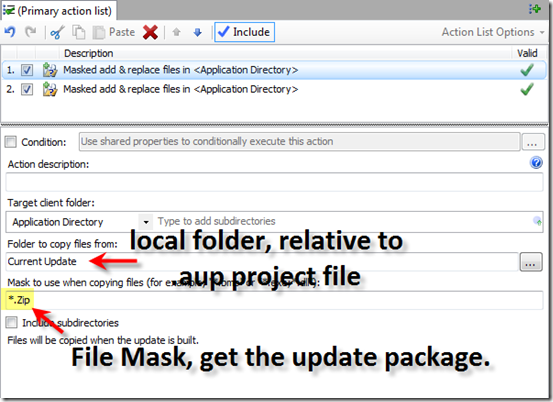 Add a new Add Element update action to your update project and configure it as below. With this action in place, the new element will be added to the configuration file when the update is executed. Another scenario where Xml actions are great is when we need to update a specific attribute. 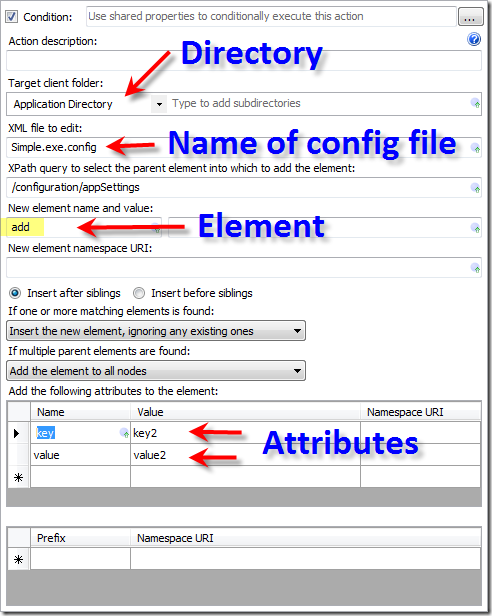 Using a Change Node action, the value of an existing appSettings entry is easily accomplished. For instance, consider the situation where in v3 of our application, we needed the key2 value to be modified to value3. This can be accomplished in a very similar process. Instead of adding an Xml Element, we can use the Change Node update action to modify an existing value. To accomplish this, we need to know the XPath that references the specific value that needs to be changed. In this case, the XPath expression is /configuration/appSettings/add[@key=”key2”]/@value. Adding a Change Node action configured like this will modify the attribute value to “value3”. In some circumstances where there are wholesale changes to a config file that would require extensive modifications to the existing file, it could require less effort to extract specific values that are unique to the installation and migrate them to a new config file. In this scenario we use Xml Actions to read specific information from the existing config file and store that information in Shared Properties. 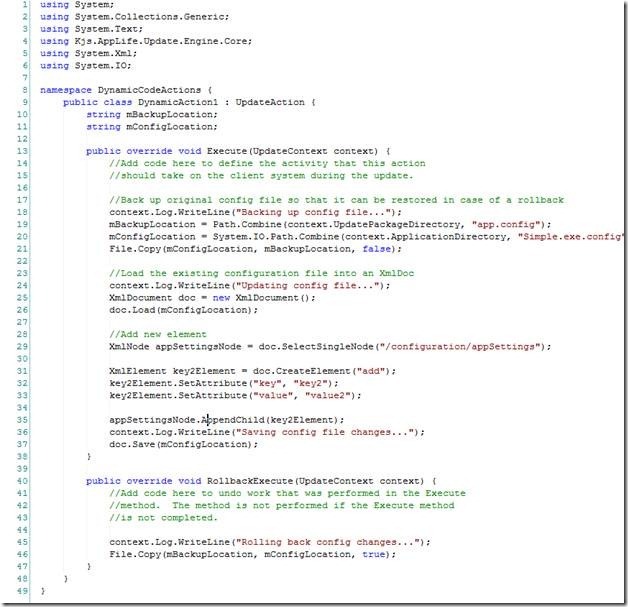 We can then replace the config file with an Add & Replace Files update action, and finally use Xml actions to write the information that we stored into the new config file. Revisiting the previous example, we’ll take this approach for the necessary modifications. We’ll read and store the value of the key1 appSetting, then replace the config file and modify that value in the newly replaced configuration file. 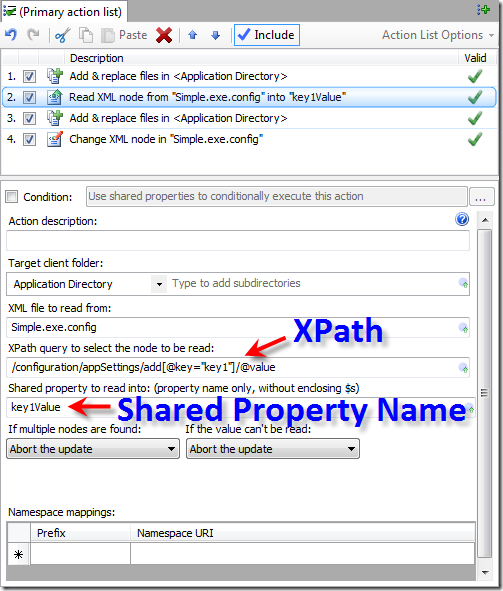 Reading the existing value, we’ll add and configure a Read Xml Node Action. Using this action, we set the config file name and XPath just as before. We’ll also designate a Shared Property to store the attribute value. Shared Properties are essentially variables that are scoped across the context of the executing updates. They allow for information to be shared between update actions. 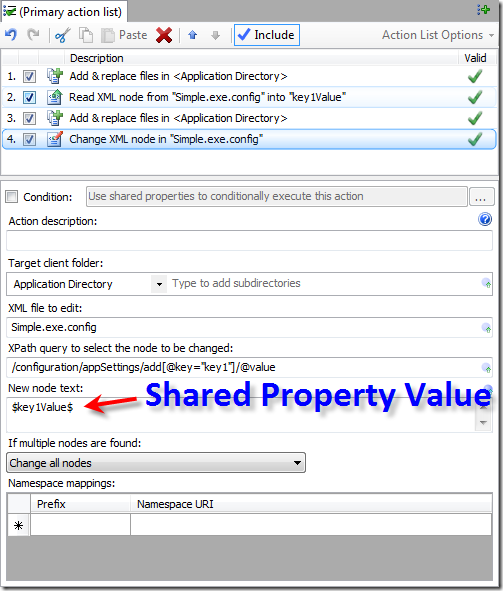 The Read Xml Node action will assign the string value of the designated attribute to the designated Shared Property. 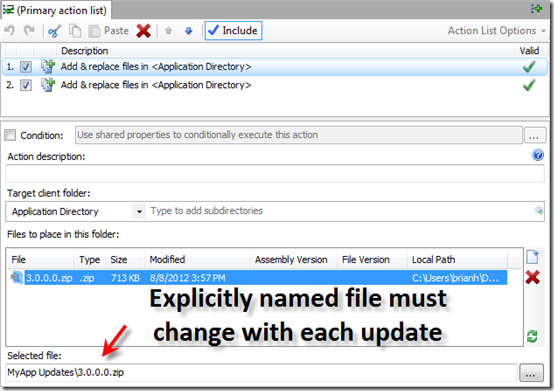 With the value of the existing attribute stored, we can replace the application configuration file using an Add & Replace Files action. After this action executes, the application configuration file will be replaced with a new updated version. However, the value of the attribute we are interested in will also have been reset to its default, non-customized value. To complete the update process we need to use the value that we previously stored to change the new configuration file. 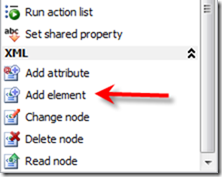 A Change Xml Node update action will update the attribute value. When using string value Shared Properties, the value of the Shared Property can be expanded using $SharedProperty$ syntax. 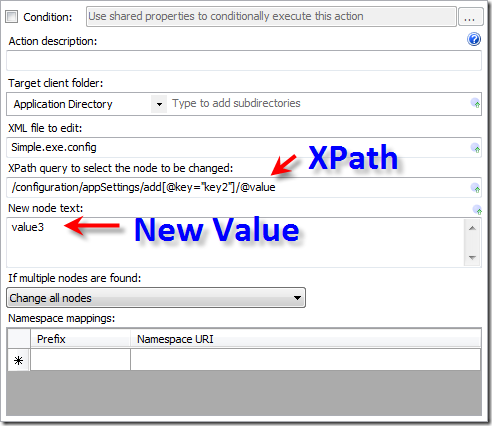 The Change Xml Node action restores the value originally set on the specific client and completes the update process. When using Xml Actions and Shared Properties, we read and write string values to the config file. In some circumstances, it can be beneficial to approach the Xml maintenance process within code, where the Xml can be manipulated in fragments. This too can be easily accomplished during an update using the Dynamic Code Action. A Dynamic Code action allows you to easily create a custom update action, which extends the UpdateAction class and overrides, at a minimum, the Execute and RollbackExecute methods. 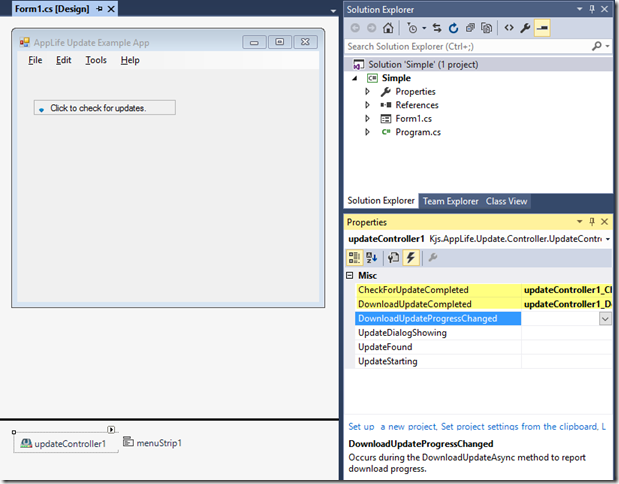 With a Dynamic Code action you can use C# or VB.Net code to manipulate the deployed client. Here we use the context parameter to access the information we need to accomplish our goal in code. You can access local directory information as well as the Shared Properties collection. With this information, we load an XmlDocument and manipulate the file within our custom code. During software maintenance updates, application configuration files that are uniquely modified for each installation cannot be simply replaced as changes are made to support new versions. These config files must be modified in-place during the maintenance process. Using AppLife Update, application configuration files can be easily maintained throughout the life of the application and we present three different approaches to accomplishing the goal.